Mild and natural with character, thanks to finest Panama cocoa and coconut blossom nectar. This bestows a light caramel-like flavour and evinces a lower glycemic index (effect on the blood sugar level). 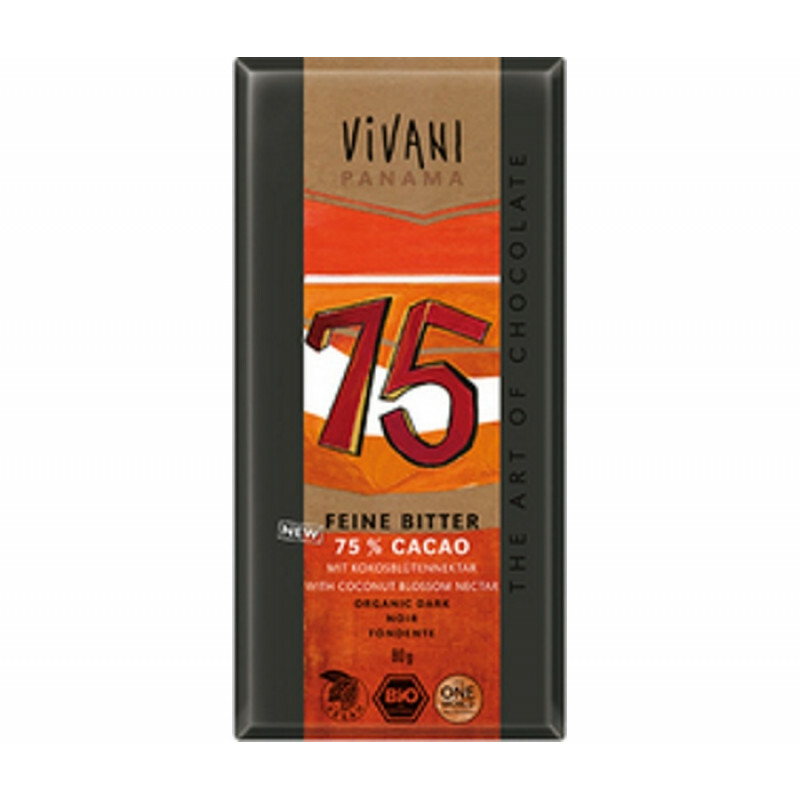 The 80 g bar means that "Dark 75 %" is a little flatter than VIVANI’s standard 100 g large format bars. Gourmets know that this turns a peerless taste into a consummate experience. cocoa mass*, coconut blossom sugar*, cocoa butter*. A great number of different sorts of chocolate are made at our production site. These include chocolates that contain ingredients like almonds, hazelnuts, biscuits, cornflakes, milk, and yoghurt powder. Although all the machines are cleaned according to the highest standards of hygiene after every batch process we cannot rule out the possibility that other products may still contain components of shell fruits (almonds, hazelnuts), gluten (wheat) and milk. Mostly, people with an intolerance to foodstuffs will not experience allergic reactions caused by these minor traces. If, however, you normally suffer from violent allergic reactions we would ask you to take care. Suitable for 1-2 people. Usually has 5-6 varieties of veg. Please note: The box contents listed..
Would suit a small family, has plenty of the basics such as apples and bananas. Please note: Th..
Chocolate Vivani Dark 85% (100g) Ingredients: 85 % cocoa mass , cocoa butter , raw caneCocoa ..
Chocolate Vivani Praline (100g) Ingredients: Chocolate: Cane rough , cocoa butter , mil.. Ingredients: Raw cane sugar , cocoa butter , cocoa mass , full milk powder , coffee , Cream powder ,.. Choose one of our standard seasonal veg boxes and fruit bags OR order exactly what you want from your own shopping list. We are totally flexible! Did you know that you can tailor our standard boxes to suit? If you don't like a particular item that's no problem - just let us know and we'll give you an alternative instead. Sign in as a guest or set up a new account easily and pay securely online. Or if you'd prefer an automatic delivery every week just give us a call - it's easy! Click here to check if your address is covered by our local delivery vans but don't worry either way because we can also deliver to EVERY county by courier! Green Earth Organics is a 30 acre mixed organic vegetable farm located just outside of Galway City, Ireland. We create your very own customised fruit and vegetable order and deliver only the freshest organic produce right to your doorstep on a weekly basis. We deliver locally in Galway, Mayo, Limerick and Dublin (NEW) for only €3.50 (depending on your address) and also nationwide via courier. We have over 200+ certified organic products on our website – including organic butter, cheese, eggs, coconut oil, nuts and seeds and even wheatgrass! Most of our customers join our box scheme and receive a seasonal box of fruit and veg delivered to them automatically every week. Other customers prefer to shop for exactly what they need online and order from their own shopping list. Whatever works for you! Contact us in Galway (091 793 768) or Dublin (01 460 0467) if you have any questions. Thanks for supporting a family owned local business. FIND OUT HOW IT ALL WORKS! Subscribe to our newsletter and get €5 off your first order when you spend over €30.